Jazzfest is going on in New Orleans this weekend, right? 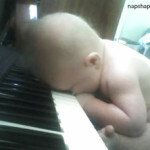 It looks like this aspiring pianist may have been gigging a little too late last night. That or, possibly, he could benefit from fewer ballads and more upbeat tunes. Never lose that napping groove, my friend.